Our Sandrine wide french bookcase or storage cabinet is finished to order in the UK in the colour of your choice. With four shelves, two drawers and elegant styling this bookcase would suit many rooms. Shown here is the narrow version in Antique White. The larger version is the same except wider and with an extra drawer. It can also be finished in Silver, Gold, Noir Black or any other colour of your choosing. You may also select different knobs or handles for the drawers. 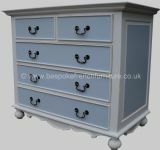 The price shown is for an Antique white finish and for the drawer knobs/handles shown. Different colours and handles may require a price adjustment - please contact us for a quote. This bookcase can also be custom made wider and/or with two drawers - just ask us for a quote to have this made to your own dimensions. Complementary pieces can be found in our Sandrine Collection. Dimensions in cm: 120W x 34D x 182H Other sizes possible on request. We have a 50cm narrow version - item code BE811. 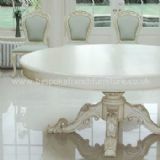 Colour/Finish: Shown here in Antique White but can be finished in the colour of your choice!